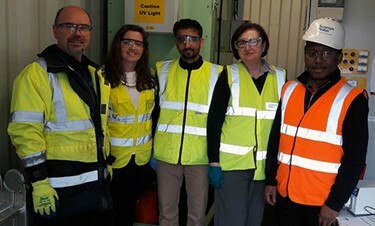 A De Montfort University Leicester (DMU) team has trialled a pioneering new system with the support of Scottish Water to clean toxic industrial wastewaters -- a process that could benefit our health, the environment and industry. Conducted at Scottish Water's wastewater development centre, the trial removed toxic pollutants to a level that would enable the waste to be treated locally. This means the water is cleared of a large number of 'nasties' -- such as oils and pesticides - so that it can be disposed of in a way that meets strict regulations. DMU's Wastewater Research Group, including PhD students, carried out initial scientific testing ahead of the three-month field trial, focused on the removal (advanced oxidation process) of priority substances. The university's reactor, housed in a shipping container, was transported to Bo'ness to the wastewater development centre run by Scottish Water Horizons -- a commercial subsidiary of the utility.